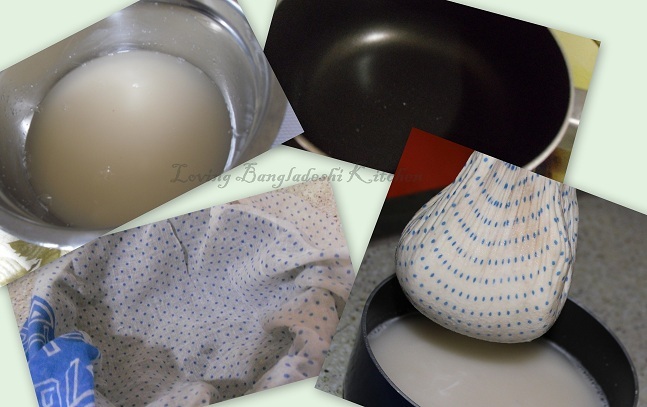 Boil the milk in a pan and reduce it to around 4 cups and set it aside to cool down. Take 3 Tbs of sugar in the pan where you are going to make your pudding, add 4 Tbs of water and put in a medium heat to make caramel. Carefully move the pan on the heat until a nice brown color comes out. Then take out the pan from heat and put on a even surface to cool down. OR you can make the caramel on a separate pan, then quickly transfer it on your pudding pan and keep it aside to cool down. Now slice your bread to small pieces. In this recipe we sliced our croissants in the middle. Place your bread slices on the top of the caramel. Drizzle the ghee or melted butter on the bread slice, then spread the chopped almond, pistachios and raisin on the bread and keep aside. Now take the milk on a blander, add egg and sugar and bland them smoothly. You can also use hand mixer. Pour the mixture on the pan where you put the bread slices earlier. Take a saucepan large enough to fit your pudding pan. Take some boiling water in the saucepan (take such an amount of water so that when you will place your pudding pan in the saucepan, half of the pan will be under the water and the pan will not float in the water. You can use a stand to keep the pan steady). Now place the pudding pan in the saucepan and cover both the pan and then keep it in medium heat for around 40-45 minutes (occasionally check the water of saucepan; add more water if needed ). 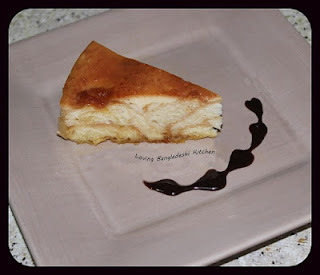 If you want to bake the pudding, preheat your oven to 400 degree F, then take a bigger pan than your pudding pan, pour some boiling water in it (take such an amount of water so that when you will place your pudding pan in the water half of the pan will be under the water and the pan will not float in the water). Now place your pudding pan in it. Cover both the pan and then place it in the preheated oven. Bake it for around 45- 50 minutes. At the last 10 minutes uncover both the pan and keep it in the oven to turn a nice golden color on the top of it. Cut your pudding to your desire shape and serve. Heat 4 Tbs oil in a pan. Add chopped onion and fry until tender. Add tomato,red chili powder and salt. Stir until tomato become tender. Add cooked keema and fry around 7-8 minutes in medium heat. Remove from the pan and set aside. Take milk in a pan, add salt and make it boil in a medium heat. 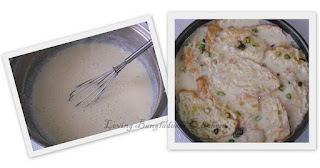 When milk start to boil, add the flour in it and stir it to mix flour with milk. Mix the dough for about 2-3 minutes in the heat. Now take the dough in a plate and keep it to cool little bit so that you can handle it with hand. Take the oil/ ghee in your hand and start to mix the dough nicely. Mix it for about 6-7 minutes to form a nice dough. Then divide the dough into small balls. Take one small ball on your rolling board. 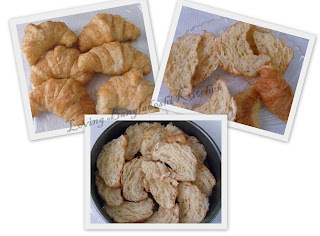 Spread little bit dry flour on it and make a thin ruti. Now place around 2 Tbs amount of stuffing in the middle of the ruti, fold all side with your finger and press to close so that the stuffing does not come out. (see the picture). 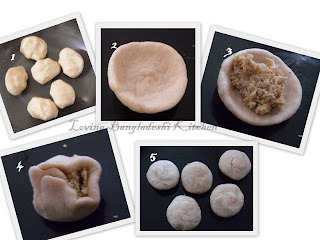 Make all the pitha following this process. Now heat the oil in a medium heat. When oil is heated enough put the pitha in the oil and fry all side, till a nice golden brown color comes out. Heat oil in a pan. Add onion and stir until tender. Add ginger paste, garlic paste, turmeric powder, cumin powder, salt, green chili, and fry them for few seconds. Then add keema and stir. Add little bit water and cover the pan. Cook until keema become tender. After that uncover the lid and dry up the excess water from keema. Then remove it from the pan and place it on a kitchen tissue/paper towel to soak extra oil. Keep it aside to cool down. Take the flour in a mixing bowl, add salt and oil in it, and mix it well so that oil can incorporate into the flour. Then carefully add the warm water and knead it. Knead the dough well until it become soft. Now divide the dough into several small balls. Take one balls, make this a little cup, place keema in the middle of the cup and carefully gather all the side in the middle by covering all the keema and press the middle to close the ball. (you can follow the steps from the picture). Make all the balls stuffed with keema. Take one stuffed balls in a plain surface and gently press it with the lower side of your hand's palm. Try to press evenly on all over it to make a 1 cm thick puri. Make all the stuffed balls like this and set them aside. Now heat the oil in a pan. When oil is heated enough, carefully add one puri into it and gently move it in the oil. 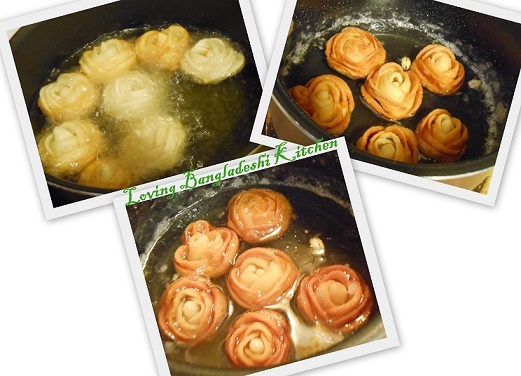 When puri puffs up carefully flip it and fry the both side until a nice golden brown color comes out. Then take it out on a paper towel to soak the excess oil. Fry the rest of the puri like this. 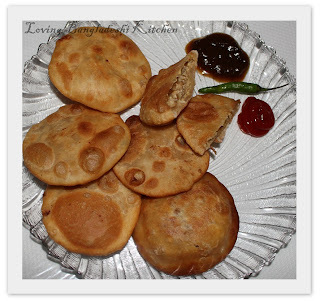 After frying all the puri, serve it hot with any kind of chutney or ketchup. Clean and wash lal shak and chop finely. Take lal shak in a pan. Add green chili and salt. Keep the pan to a medium heat and cover it. Cook until shak become tender. Remove from the pan and set it aside. Now heat oil in a frying pan, add chopped garlic and fry it for few seconds then add chopped onion and fry until tender. Add shak and fry around 2-3 minutes or fry until all liquid evaporated. Now it is ready to serve. 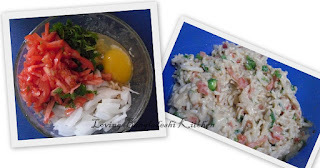 Enjoy with plain white rice. ** you can use any kind of chopped vegetable whatever you have in your home, like carrot, cabbage, beans etc. 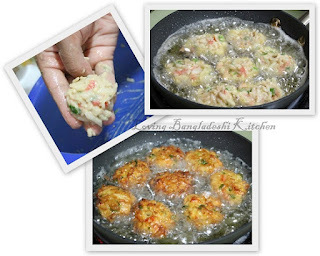 You can also use minced meat or shrimp if you want. Take the boiled noodles in a mixing bowl (there is no need to drain the water from noodles but if it seems there is too much water in the noodles drain them). Add egg, chopped onion, chopped chili, chopped cilantro, baking powder, salt and flour, and mix them well. If the mixture seems too liquid to handle add little more flour. Take out the pakora on a paper towel to soak excess oil. Fry all the remaining mixture following same process. Enjoy your pakora with sauce or any kind of ketchup. ** Usually there is no need to add sugar but if you want more sweet you may add sugar according to your taste. Remove seed from dates. Soak it in milk for 30 minutes.Blend it in a blender to make a fine paste. Heat ghee in a pan in medium heat. Add cardamon and fry for few seconds. Then add dates paste and stir.When halwa start to become thick add milk powder. 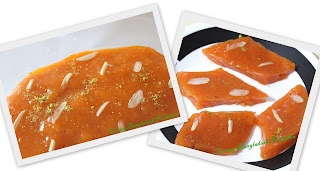 Stir continuously until it comes to halwa consistency that do not stick the pan. Remove from the pan and garnish with nuts and raisin. Now take the dough in a plate and keep it to cool little bit so that you can handle it with hand. Take the oil/ ghee in your hand and start to mix the dough nicely. Mix it for about 6-7 minutes to form a nice dough. Then divide the dough to 7-8 small balls. Take a 6-7 cm round cookie cutter or any round shape sharp edge glass or cup and cut some small round shape part from your large ruti. 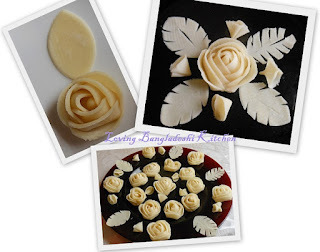 Put 3 small ruti on top of one another, take small part from the excess of ruti to put in the center of your flower. Then make your flower following the procedure described in the video. Pour the water in a saucepan, add the sugar in it and make it a boil. Then keep it in a low heat to simmer. Now heat the oil in a medium heat. When oil is heated enough put the flowers in the oil and fried the both side till a nice golden brown color comes out. (remember do not hurry during frying otherwise your pitha will remain uncooked). Take out the pitha on a paper towel to soak the excess oil. Then put them in the sugar syrup which is simmering in the low heat. 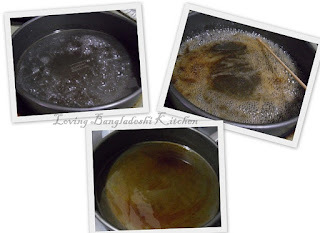 Flip your pitha in the syrup for couple of time to coat it with sugar syrup. Then take them out on a plate. Make rest of the pitha following the same process. Keep your pitha to cool down to room temperature. 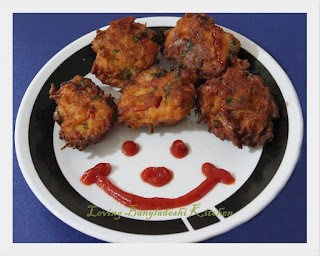 Then surprise everyone by serving this nice Golap Pitha. Heat 2 Tbs oil in a pan. Add kumro bori and fry low heat until it turns brown. Remove from the pan and set aside. Heat 4 Tbs oil in a deep pan. Add all powder and paste ingredients and salt. Stir well and fry little. Add around 3/4 cup water. When the water began to boil add begun,potato and kumro bori. Cook until all liquid evaporated. Stir for few seconds. Add around 2 cup water. Cover the pan with lid. 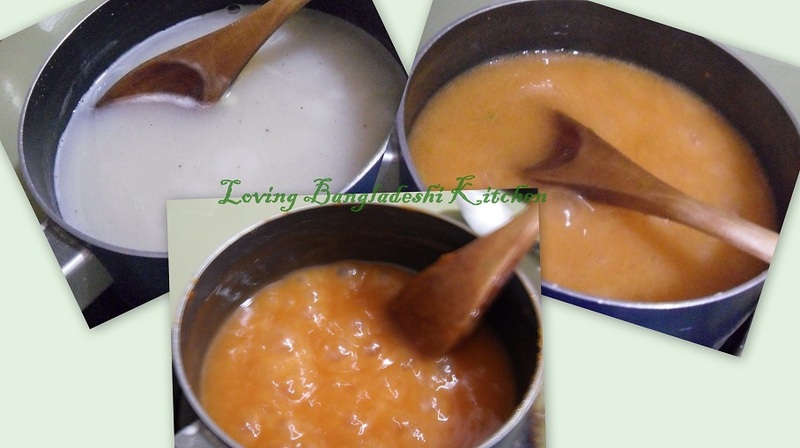 Cook until the gravy become thick and all vegetables tender. Enjoy with plain white rice or roti. Soak the semolina in the water for around 3 hours. Then strain the water through the cheese cloth in a bowl (remember for this recipe we need the strained water, not the soaked semolina). Put the pan in a medium heat, pour the strained semolina water into the pan and start to stir. Now add salt, sugar, ghee, cardamom powder, cinnamon powder, food color in the pan one by one and continue to stir. Continuously stir the halwa until it comes to a halwa consistency (it may take 40-50 minutes or little more). Spread some oil or ghee on your serving dish where you want to garnish your halwa. When halwa start to wrap up from the side of the pan, take it in the prepared serving dish. Spread it nicely on the dish. Garnish the top with pistachios and almond and keep it to cool down. Cut your halwa to your desire shape and serve. Wash the strawberry and cut into two pieces. Put all the ingredients in the jug of your blender and blend it smoothly. Take all purpose flour and rice flour in a bowl, add chopped onion,chopped green chili and salt and mix well. Then slowly add warm milk to the flour. Beat with a whisk. Add beaten egg and again beat until the batter become smooth. Keep the batter for 25-30 minutes. Take a big round shape spoon. When the oil become heated put one spoonful of the batter on the middle of the pan and round the pan carefully so that a circular shaped wrapper can be form. Turn the heat low and cook it until the wrapper can be lifted without sticking. Remove it from the pan on a plate, place some keema in a line on one corner of the wrapper and wrap it from the one corner pointing towards you and make a roll. Soak jaggery with little warm water and mix well. There should not be any lumps. Put rice flour and flour to a mixing bowl. Mix well. Add jaggery and knead well. Add little warm water and make a batter. The batter should be thick like cake batter. Cover the bowl and keep it around 30 minutes. Heat oil in a deep pan. Take a deep round shape spoon. When the oil become hot enough take a spoon full batter and add to the oil. 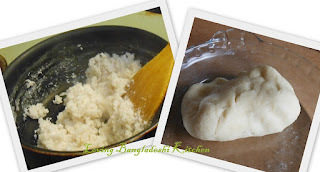 If oil is heated perfectly then pitha will remain in the bottom for few seconds and then puffs up. When it puffs up flip the side and fry. Then take out on a paper towel to soak the extra oil.